Yes, blockers will be released if you remove the terrain they're standing on. In the screenshot position, you could mine further to the left so the crowd go under the blocker, then have a lemming build to turn round so he comes up the terrain directly under the blocker, then use a miner to remove it. That's what I was trying to do, but I couldn't use any skills to Lemmings close to the blocker. I ended up placing the blocker on the ball arc, which meant I could assign a Basher to a Lemming far away from the blocker, so I didn't have this issue. Don't remember if it's any different in Windows Lemmings, but in DOS Lemmings if I recall correctly, if you cover both a blocker and a normal walking lemming within your mouse cursor, preference for skill assignment goes to the blocker. This is good if you are trying to assign exploder to the blocker, but is terrible for other skills for which you'd want to assign to the non-blocker lemming (though to be fair, only one or two levels in the game actually require you to free a blocker). 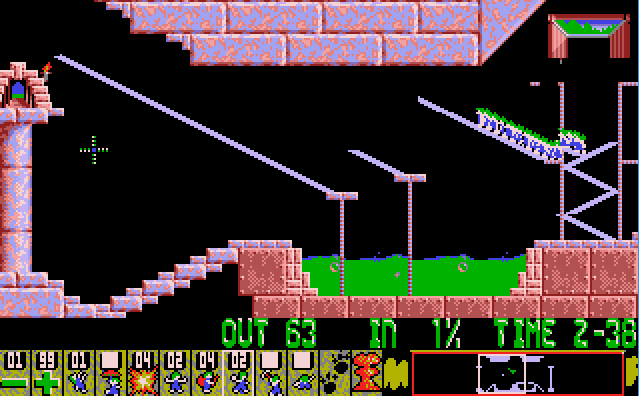 Alternatively, in DOS Lemmings you can hold down the right mouse button and then click with the left button to assign in "priority inversion mode". Roughly speaking this will let you assign skill to the non-prioritized lemming instead, in situations where the cursor covers multiple lemmings and one is prioritized like the blocker. In certain other ports like the Mac you would hold down some key like Alt to activate this mode instead of holding down right mouse button. Not sure if this kind of option exists in Windows Lemmings. Actually, further testing shows that while DOS Lemmings prioritizes the blocker, it looks like it will also usually automatically fall back to the non-prioritized lemming for skill assignments that cannot be performed on the prioritized lemming, such as many skills on a blocker. Maybe Windows Lemmings does not have this fallback behavior so the skill assignment doesn't go to the walker as easily as it would in DOS Lemmings for the situation in your picture. Why did you change the title, Simon? Woah, I didn't know there were any advanced selection options in the original Lemmings! Accordingly, the topic title should be precise. Help your readers infer what the topic is not about. "607" is more robust than "My". For example, neither the forum's list of recently updated topics nor the IRC bots print the name of original poster. These announcers print only topic title and the name of the last poster. You plan to post about original Lemmings and perhaps ONML whereas "Lemmings" could mean all games within the trademark. Every topic contains a discussion. Every topic is a topic. Thus "discussion topic" can be safely cut to declutter. All of that makes perfect sense, it just feels rather unnecessary. I'm not offended by it or anything, but it feels unusual having my topic suddenly under a different title. 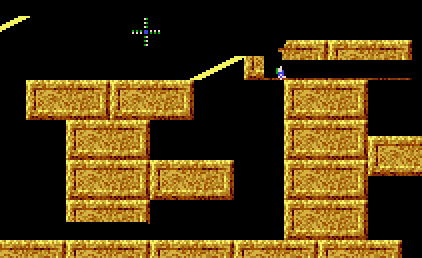 Related to the discussion topic (and not solely to playing as the title now suggests, but I will in fact make a new topic if I start writing more about this): last night I got a lot of ideas for custom levels again, so I might start creating Lemmings levels another time... however, I want to finish the main Lemmings game first, as I feel like I've always started designing levels too early. If I've completed the original game, I should have more experience with level design in general, and I might be able to create challenging levels myself, instead of the tutorial levels my previous attempts have mostly been restricted to. Well, this was a very messy solution. This was my second attempt, and as my first didn't work out well from the start I decided to consider a bit about how I should start, and I did what you see at the start of this video. However, I hadn't thought the rest through, and mostly improvised... but it worked! The help file of Winlemm says the ctrl button is for assign to walker. Though I can't say if right click has the same effect. Winlemm has directional select with the arrow keys, too. Ah, thanks! I couldn't find a help file, any help button I clicked opened Edge or gave an error. Yes, directional select is useful. I now realise I could maybe have used that to free that blocker! It's time for Curse of the Pharaoh... with How Much is that Doggie in the Window, apparently. I already love how you can kill one Lemming, and get 1 blocker and 20 bombers. At first this level seemed really easy, but it's not so trivial as it looks. There not being directional select makes things a little more difficult, as it's inadvisable to rely on inside bashers to free the crowd. Aw... I ran into an issue of getting the crowd up to the final basher tunnel, but it looked like I was going to save it: and then I didn't, as one Lemming got stuck in the terrain. I do notice I've got a digger... maybe I can use that somewhere. And I did end up using it, for this trick! I had two bashers left over, though. I wonder if there's a different intended method? Actually, I can use the same solution... and it's an easy one to execute. I feel like this isn't the intended solution. Edit: I'm continuing, even after WAFD. I did find a good way through it relatively quickly, but had one issue: there's no directional select, and I didn't have too many builders to waste for getting the crowd out. Then I invented a way to have directional select in such situations, in the original game: assign a Lemming a floater or climber, and follow it to see which way it's going! Lemmings with skills assigned have priority, after all. However... then I realised there was a bigger issue. There's a time limit. Edit 2: Okay, the floater trick isn't working... however, I got an idea for another trick to use for that part! I can let a Lemming build the first half of the bridge early, when there are still so little Lemmings that I can select the right one. Lemmings will then only move in the right direction on top of that bridge. Edit 3: This is how I contained the crowd! I wonder if anyone used another way? And hooray, I beat it! I kept forgetting that my worker Lemming was a climber, so I'd accidentally let him climb up the steel to the exit. However, the time limit was lenient enough to let the crowd finish the building. Edit 4: I guess I'm not stopping yet, as I had quite some time today after an exam, and was too tired to study... (plus I've studied enough already the past days) and Lemmings seemed like a fun way to relax! The next level, The Great Lemming Caper, also doesn't seem familiar (is it a non-repeat as well? ), and it's another 100% save rating level! 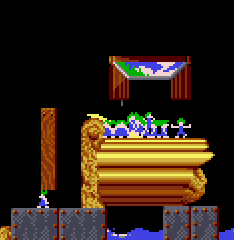 This seemed like a very difficult level, and then I realised: there are only two Lemmings! Now that's interesting! But I'm almost certain that it can't be intended to use it, as it's a counterintuitive trick... But how else would it be possible to solve this level? I'm considering looking it up, but I feel like one of you might be able to give me a hint. For now: I've beaten the level! Edit 5: Pea Soup is an easy level at this point, but the terrain is very creative! And now I'm finally quitting. I've got to make dinner soon, and I don't know how long the next level might take. For the majority of original levels, we don't know whether the designers ever had a specific "intended solution" in mind, and they certainly weren't all that concerned about preventing alternatives, given the abundance of extra skills and different possible approaches. Pillars of Hercules can be solved by the left or right route, or by going through the terrain at the top. The Far Side is indeed not a repeat. I always contained the crowd by one of the methods you mentioned, building only half of the bridge out of the starting area, then leaving them there until near the end. The Great Lemming Caper is a repeat of Nightmare on Lem Street. You probably forgot this because the Fun version is one of the quickest and most forgettable levels: just build over both gaps and you're done. Indeed, it has several different solutions without using glitches. Nessy even made a compilation video showing off a number of them. Your solution can actually be made glitch-free with a very small change, given that you have a large number of destructive skills. However, there's one particular solution that's extremely elegant, so that I've always thought it was probably what the designer intended. If you want a hint towards finding this solution... it's not so very different, but the second builder should be in a different place. Ah, right, of course! Yes, that's very nice. It's a nice solution. There are a few different ways to solve that level. That's actually a really good level as I feel it has a puzzle element attached to it. With the (Curse of the Pharaoh) level I sometimes use some of the builders in the middle of the level before bashing the pyramid I build back over so that it gives the lemmings a massive walk before they get back to the pyramid so that there are not loads of lemmings when it comes to building to the exit as you could end up building the wrong way otherwise. Actually thinking about it that might be more of a unique solution well maybe not. Go for it 607, you are doing good. I was waiting for your response! Also: I learnt today that I don't actually know what solution you mean... as climbers can't climb through bridges/stairs, and there would be a lot of precision required to let the climber first climb past the unfinished bridge and then land on top of it.